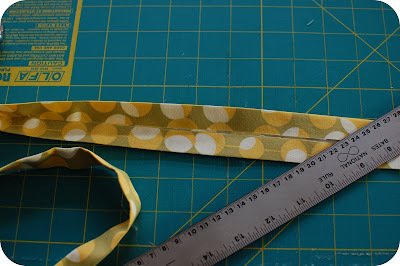 I promise, this is the last time this Amy Butler fabric will show up on my blog. But I still had scraps left over from this and this and I couldn't bear to let a single scrap of it go to waste. I decided to make a quilted potholder. 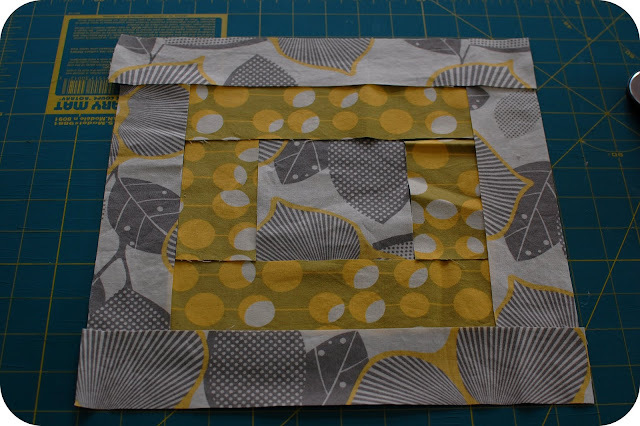 I started with a 4" square for the center and used 2" wide strips the rest of the way around. Here are the strips all cut and laid out in a log cabin pattern. Sew from the center out until all the pieces are attached. Iron seams flat to make the quilting easier and neater. When the top is finished, make a quilt sandwich. Cut a piece of fabric for the backing and use two layers of batting for the padding. Line all four layers up, pin, and start quilting from the center. I decided to quilt a simple square pattern starting in the center. 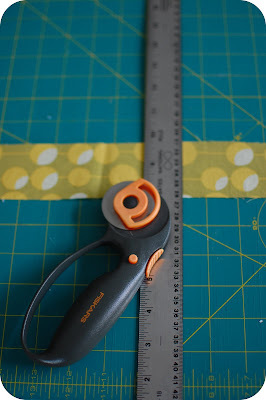 Once your quilting is finished you may need to trim the edges to make sure things are all lined up. Next, attach seam binding. 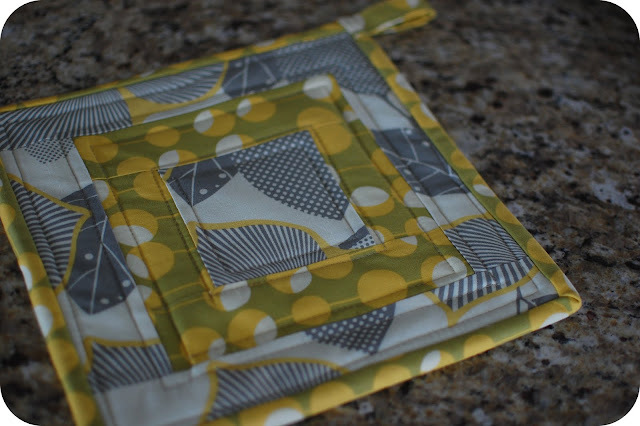 I made mine by starting with a 3" strip of fabric, long enough to go all around the edge of the potholder. 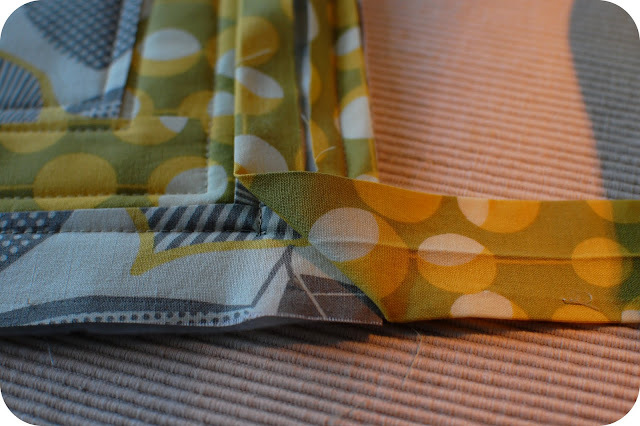 Make the seam binding by ironing strip in half, opening, and ironing each side toward the center. 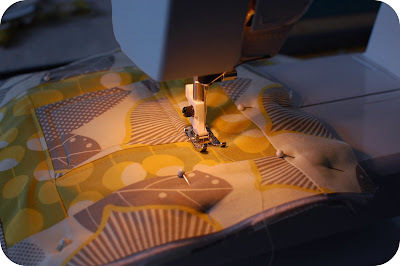 For a helpful link on attaching seam binding, click here. 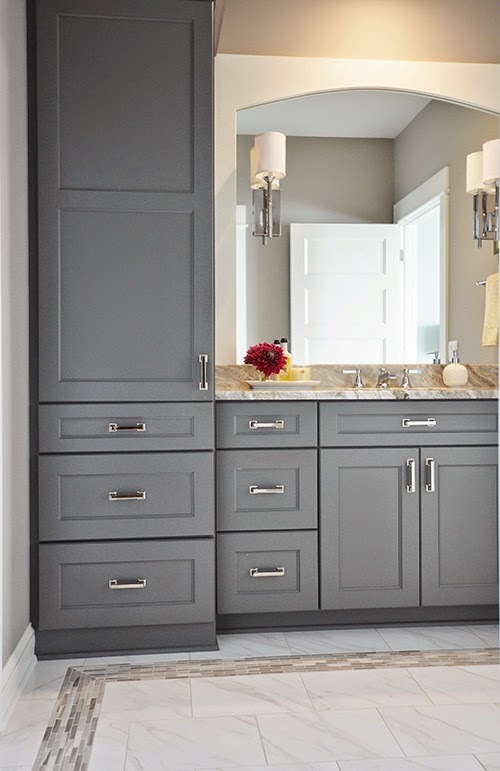 This is a really easy, quick project. I think a couple of these cute potholders would make a nice little gift. SNS @ Funky Junk Interiors here! Make it for Monday @ Cottage Instincts here! Just Something I Whipped Up @ The Girl Creative here! Making the World Cuter here! Make Your Monday @ Twice Remembered here! We Did it Wednesday @ Sew Much Ado here! Make it Yours Day @ My Backyard Eden here! Friday Fun Finds @ kojo designs here! Be Inspired Link Party @ Room to inspire here! If you ever get tired of having that lying around the house I will HAPPILY take it off your hands for you. Just trying to be a good blog-friend. Where'd you get your fabric? Order online? I LOVE Amy Butler Fabrics. Thank you so much for letting me know about the comments problem. I must have changed something without knowing it. Once again I have to say how much I love your photos. I have to look at your posts twice. Once to see the post and once to see what I can learn from your photos. This is not a potholder. It is a work of art. I wish I was comfortable with sewing- I would love to make this! It really could be translated into bigger things it's so lovely. 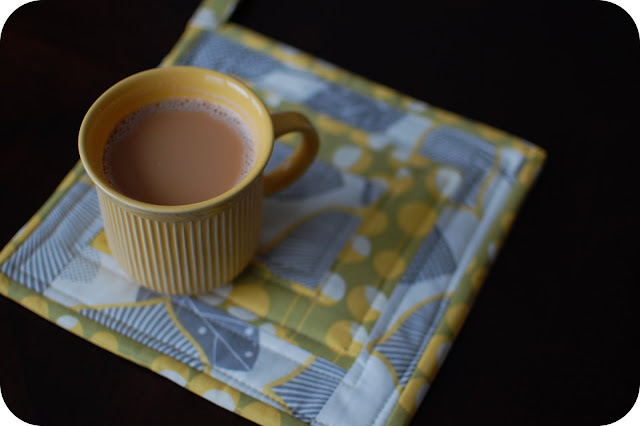 Placemats, even blankets. I love your mix of projects and pictures. I left you a little award on my blog tonight. Love Amy Butler - I think it will be hard not to make anything more with her fabric. Her designs are always inspiring! Love your photos - what kind of camera do you use? Very pretty outcome! And wonderful tutorial. Wow. Jen - I have a local fabric store that sells lots of Amy Butler fabric. It's a little dangerous b/c everytime I'm there I feel the need to walk out with more of her fabric! Barbara - I have a Nikon D40. It's the most basic SLR camera you can buy. I purchased it 3 years ago before a trip. It's a great camera for someone who's never used a SLR before - I've been really happy with it and have learned a lot about photography. 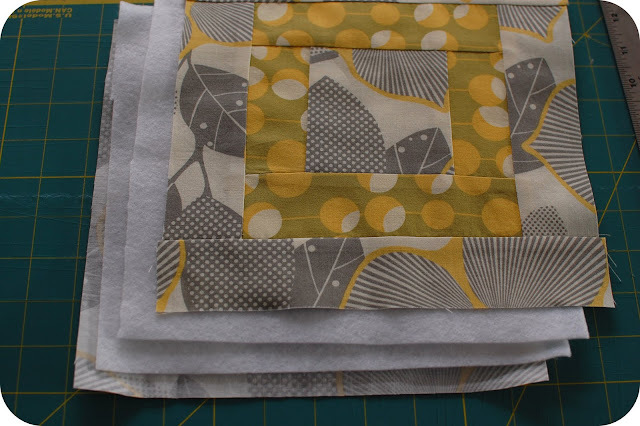 There will definitely be more Amy Butler projects - just not with this exact fabric! That is lovely! Much nicer than anything you can buy at the store! Love the color combo, too. my oh my. beautiful. 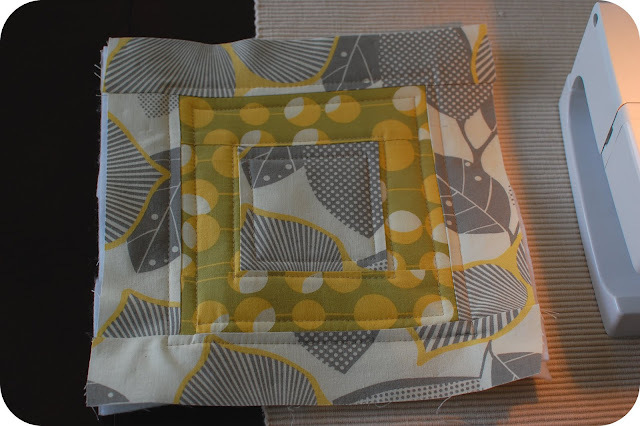 i loooove that fabric, the yellow and soft gray are a divine combination. and you rock at binding - that is always my downfall. What a great project to use up all my leftover fabric scraps ! These are beautiful! I love them, but can I just say, it is not as easy as it seems to get flat lines... I guess I am just too impatient! I love this though, someday I will try to learn how to do it! This is so dang beautiful! I can't believe how easy you make that look, I can guarantee you that even if I followed your instructions explicitly that mine would not look like a pot holder in the end! You should sell these! Thanks for sharing and for linking back! That is so cute! I love it (and the fabric too :)). Thanks for playing! I can never get enough Amy Butler! I love these. Thanks for showing us how to make them. I'm having a link party and would love to have you come over and link this project up! Oh, how I love this! I think you might even be able to use fabric scrap if you were creative (at least for the middle pieces!). So cute! 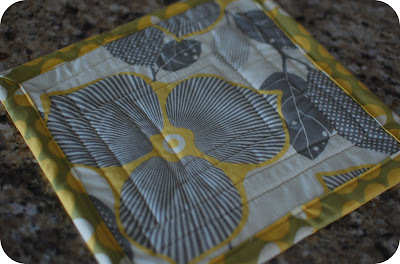 I've never quilted before, but this project makes me want to give it a try :) Thanks for sharing. These would make a great gift! I recently became the owner of my first sewing machine - I might have to give this a shot. 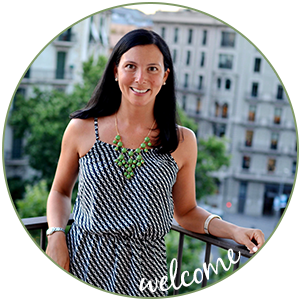 Thanks for linking up to Be Inspired! I have not been transformed yet. I have signed-up for many classes but I guess I just don't have it in me. CONGRATULATIONS,YOU DO!! THANKS FOR SHARING! I have that floral material too...way too cute! I am inspired to create not only the domestic goddess aprons but also the pot holders for Christmas presents for my mother in law and my Mama! Thanks for the inspiration! I think this is beautifully made. I love it. I wish I would have seen this yesterday as I was looking for a small project to give to a friend when we had lunch together. My only question is should you have an insulated heat fabric in between the batting layers to protect hands from heat as in the case of pulling out the hot chrome shelves from the oven? Two years ago, I started my first quilt. I got half way through it, got super intimidated and stopped working on it, then I was getting ready to move cross country and am now finally settled in. I keep looking at that quilt, barely half finished, afraid to try to finish it. Anyways, I literally stumbledupon your site last week and the thought of a quilted potholder was far less intimidating. 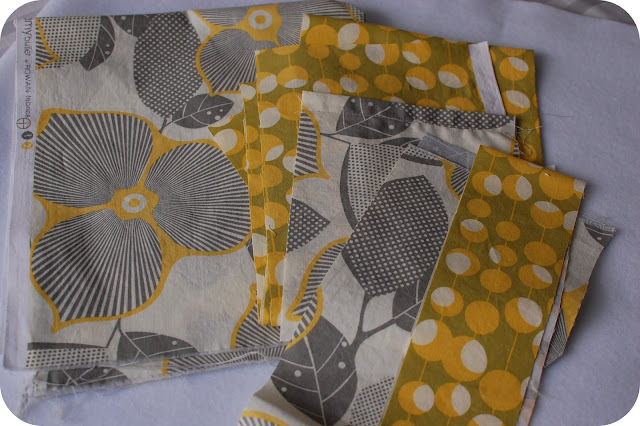 I purchased a small bundle of fabric over the weekend and am nearly finished. It looks great and my quilting confidence is restored. I love your site. Thanks for the simple project that got me back at my machine! yellow with gray... simple fantastic!